Through this two-day state-level gathering, STRIVE partner KHPT rallied support from across the political spectrum for girls’ education. 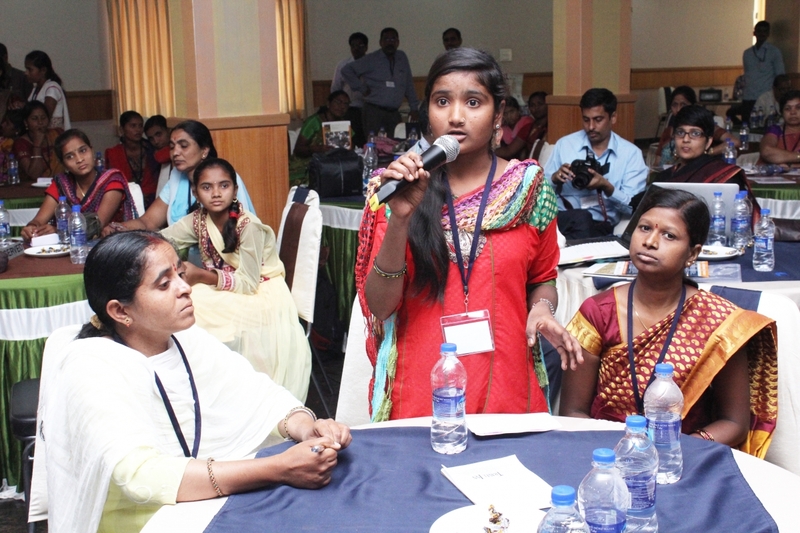 The Karnataka Health Promotion Trust (KHPT) held a state-level conference, ‘Keeping Girls in Secondary Schools: Successes and Challenges’, in Dharwad, Karnataka, 20–21 June 2015, as part of the Samata programme. The conference provided a platform for government officials, practitioners, field and project workers and community members to share experiences, achievements and concerns. All the Commissioners of Education, Deputy Directors of Public Instruction and Block Education Officers (BEOs) from North Karnataka attended the event. From Samata, all the outreach workers and a contingent of very excited young girls were present. Participants were especially appreciative of KHPT’s efforts to ensure that everyone could take part. The team translated every presentation into the state language Kannada, supplied separate Kannada kits and provided real-time interpretation from Kannada to English and vice versa. The event received wide coverage in local media. Of particular interest for STRIVE and KHPT was a session focused on ‘Structural Barriers to Girls’ Education’ providing qualitative and quantitative evidence of the extent to which adolescent girls’ education is hindered by socio-economic norms and practices. Dr Reynold Washington, Managing Trustee of KHPT, welcomed the guests, and Raghavendra T, Director of Programmes, North Karnataka, KHPT, presented an overview of Samata, KHPT’s innovative and comprehensive programme to keep girls from disadvantaged communities in secondary school. In his inaugural speech, Kimmane Ratnakar, Minister for Primary and Secondary Education in the Government of Karnataka, exhorted the audience to help propel change. Development is directly related to education, and education levels in North Karnataka, especially those of girls, are very low. The Department of Education has to work together with the NGOs to provide girls with a safe environment and extensive opportunities. I request all the officers attending the conference to send me recommendations on strategies that the government should adopt to further girls’ education. Dr H B Chandrashekhar spoke on behalf of Sarva Shiksha Abhiyan, the State’s programme to ensure that education is accessible to all, emphasising gender differences in educational attainment of girls as well as government’s successes and challenges over the years. After adolescent girl leaders from Samata spoke about the lack of toilets, water and sanitary napkins as barriers that they encounter, government representatives gave examples of successful steps to mitigate these barriers and to improve girls’ experience of school. Education of women and girls opens the door to employment and can reduce discrimination. It is an instrument for social change. Bellad noted that Samata addressed the link between HIV and education. Emphasising that the whole of North Karnataka needed such efforts, he expressed his support for the project. He asked for creative ideas and renewed efforts to keep girls in school and eradicate HIV. Local NGOs participated actively through presentations and in discussions. K.G. Santhya from Population Council delivered the keynote address on the global scenario of girls’ education, focusing specifically on the state of the evidence from countries in the global south. She congratulated KHPT for organising the conference in the 15th anniversary year of the Dakar Framework for Action and the deadline year of the MDGs. Enakshi Ganguly Thukral, co-founder of HAQ: Centre for Child Rights noted that the education budget had been reduced by 20%. She questioned whether there are too few schemes or if the schemes are not reaching those in real need. She concurred that the age limit stipulated in the Right to Education (RTE), currently set at 14 years, was too low. Arunima Bose and Prarthana Kumari of Nirantar Trust presented on the Impact of Discriminatory Gender and Social Norms on Adolescent Girls’ Education. Sonykutty George, Child Protection Specialist at UNICEF Hyderabad, called attention to the 70-80% rate of child marriage in Bihar and North Karnataka in his presentation and asked for a multipronged agenda. Rishikesh Shanker, Leader, Hub for Education, Law and Policy (HeLP) at Azim Premji University spoke on School Level Barriers to Girls’ Education wherein he shared the example of a village school from Malnad. Gurumurthy Kasinathan, Director of IT for Change, chaired the panel and in conclusion noted that while the HDI of Karnataka’s neighbouring states Kerala and Tamil Nadu ranked high, the North Karnataka statistics were worse than Bihar. Anil Joshi's presentation focused on how their innovative hands-on science learning methodology had paved the way for girls from rural India to compete and win at the international IRIS competitions. In her address, Indira Pancholi spoke about Mahila Jan Adhikar Samiti’s [MJAS] successful work in three districts of Central Rajasthan to prevent child marriages. There, MJAS have trained adolescent girls to identify and map resources, services and units of local governance of their village and promoted their aspirations to higher education. Shweta Bankar, Asia Regional Office of the International Center for Research on Women [ICRW], presented their work Challenging traditional scripts for girls and breaking down gender stereotypes. In an urban slum in Mumbai, 35% of the majority of the Muslim population are out of school. Satyashree Goswami from National Foundation of India screened a film ‘Yuva’ about a group of tribal girls from Jharkand that showed how a group of girls from rural Jharkand in India went to Spain to compete in an international football competition. She used it as an example to tell the adolescent girls in the conference that they too can achieve such successes. Ishita Chaudhry, Founder, The YP Foundation spoke on ‘Involving the Youth to Address Community Gender Norms’. Sreeparna Ghosh, Assistant Professor at the School of Development, Azim Premji University took the session further with her presentation on School Interventions to Retain Girl Students. Dr Enakshi Ganguly Thukral used her 15 minutes to solicit recommendations from the audience about working together at different levels within the community to retain girls in school. In the closing ceremony, Basavaraj Horatti, Member of Legislative Council and Former Education Minister, noted that teacher vacancies in schools in Karnataka remained unfilled since 2007. He assured the attendees that he would raise the issue of increasing the age of compulsory education to upper Secondary School Leaving Certificate (SSLC) in the Assembly. He acknowledged the prevalence of child marriage in North Karnataka and extended full support to Samata’s efforts in preventing it. Jagadish Shettar, Leader of the Opposition in Karnataka Assembly, solicited data from KHPT that compared the situation of girls’ education in North, North-East and South Karnataka and assured those present that he would present the same for discussions in the next Assembly. A new NGO alliance was born at the conference, uniting a number of participants in an advocacy group. Political leaders from all the parties have agreed to follow-up on the recommendations that emerged during the conference from both the government officials as well as other members of the audience. This new NGO alliance will work as a pressure group to keep the authorities to their promises.